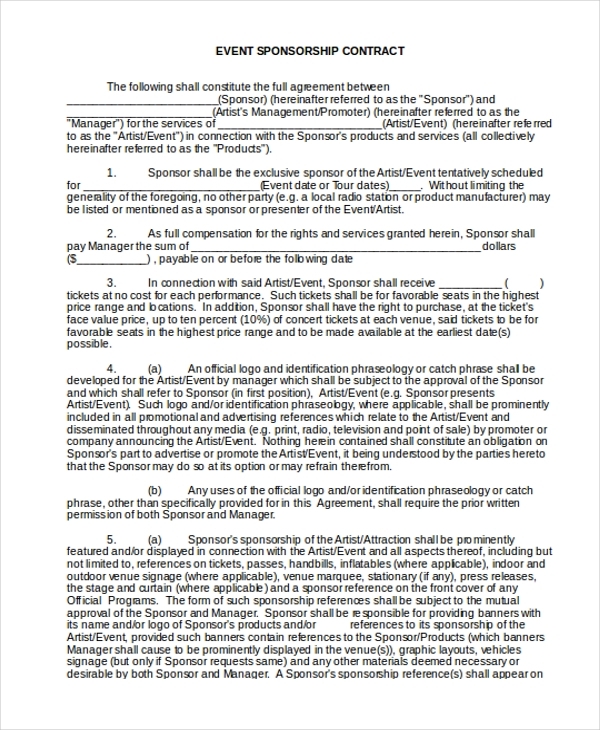 This contract form is used by an event vendor to legalize a dealing with an event organizer. The form would contain the details of the event, the service required and the amount payable. 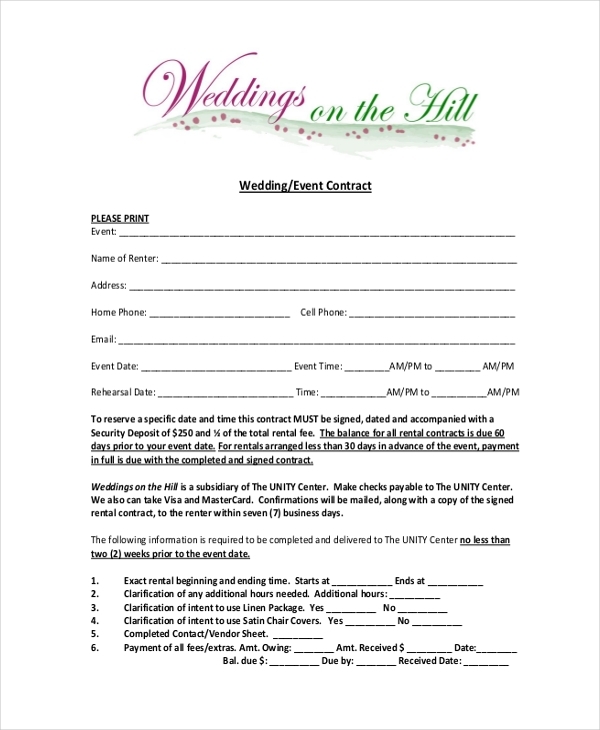 A person organizing a wedding event uses this form as a contract that binds him as well as the wedding party to certain terms and regulations. It also comprises of the details of the event to avoid last minute hassles. 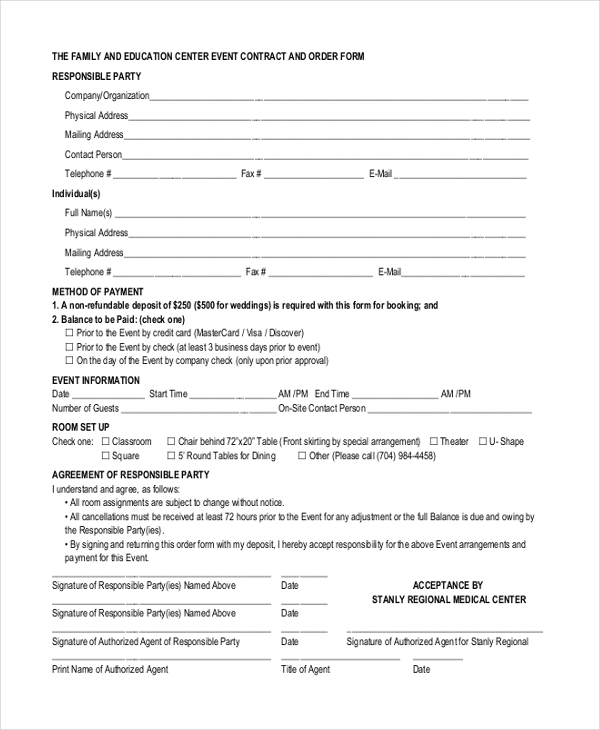 This is an example of how an event contract form should look. It contains all the important segments that should be a part of such a form and the legal jargon that needs to be included. 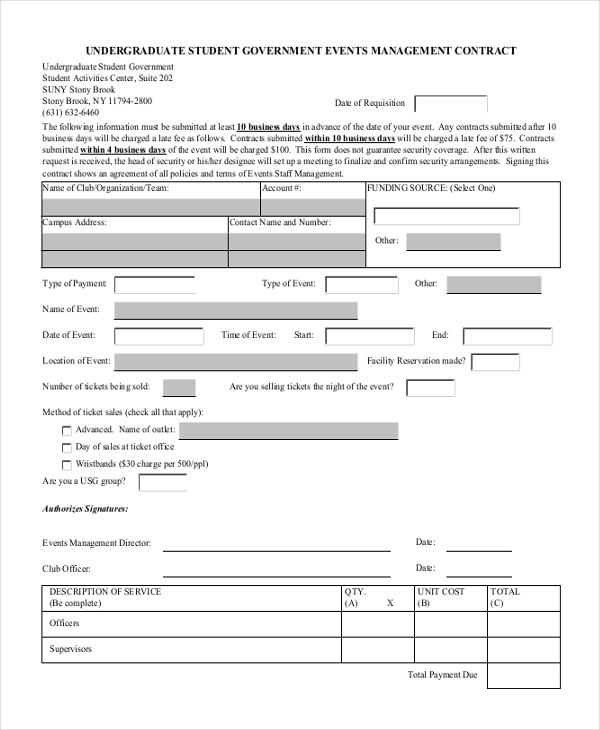 This form is used by a vendor who may be offering his services to a family center or education center event. The form allows the vendor to sign an agreement with the organizer such that both or legally bound to follow the terms agreed upon. Usually when a person agrees to sponsor a particular event, he is required to get into a contract with the organizers. By signing the contract form, both parties agree to follow the terms that may have been predefined. 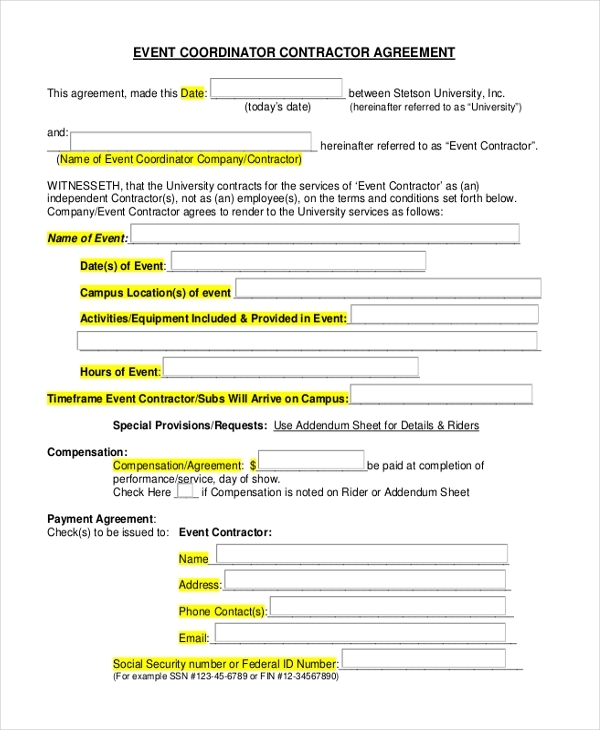 This form is used by the contractor to sign a contract with the event coordinator before agreeing to offer his products or services for the event. The contract binds the parties legally to follow certain terms. 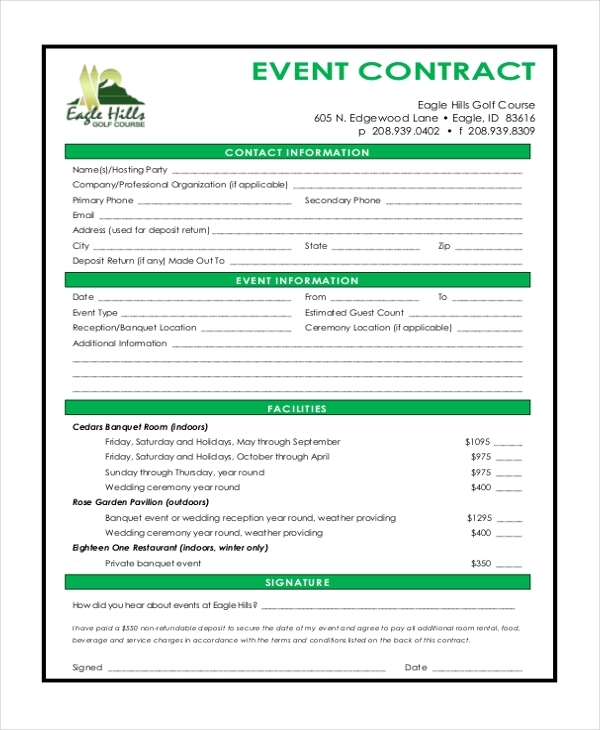 This event contract form is generally used by an event management firm that may have agreed to plan an event. The form ensures them that the party would keep its word after the completion of the event. This form is mainly used by a studio or photographer who may have agreed to offer his services for an event. The forms once signed acts as an agreement that legally binds both the parties. 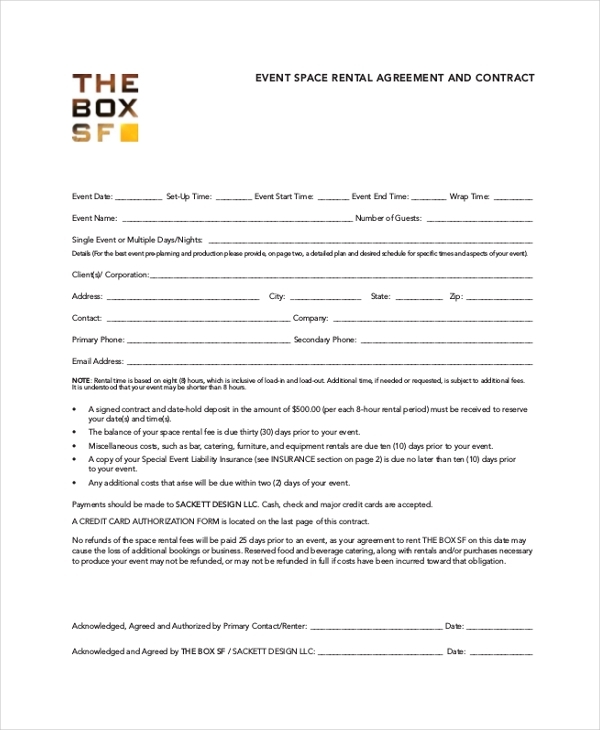 The company that supplies various equipments for events uses this form to bind the renting party in an agreement. The form ensures that the equipments would be duly returned along with the agreed fee. 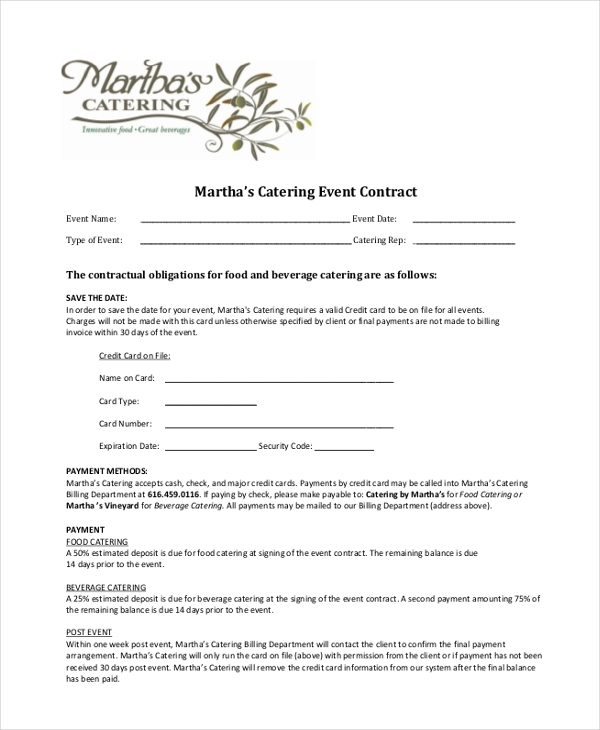 This event contract form is used by a catering service which may have agreed to supply food for an event. The form comprises of the details of the event along with the menu and payment details. Who Uses an Event Contract Form? Why Should One Use an Event Contract Form? What are the Benefits of Using an Event Contract Form? 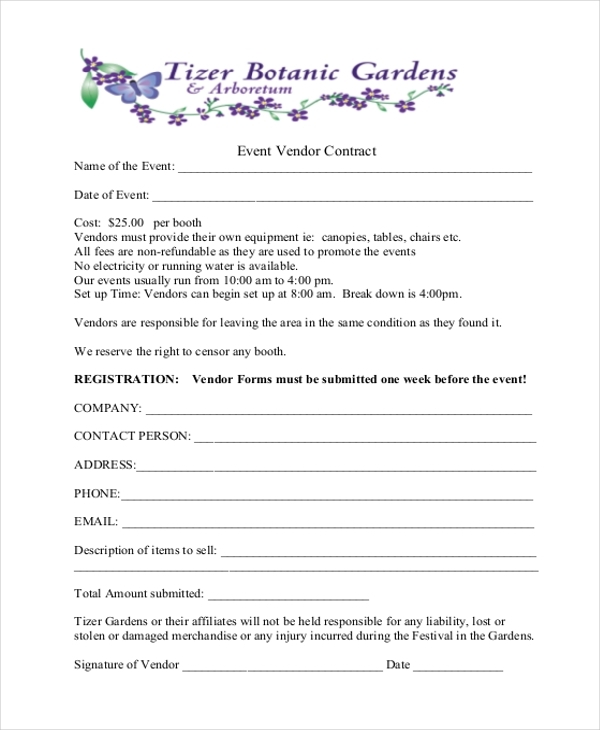 There is no denying the fact that using an event contract form can make life easier for the vendors and the event coordinators. However designing such a form certainly requires some expertise. In case, you feel that you cannot do it without expert help, don’t worry. 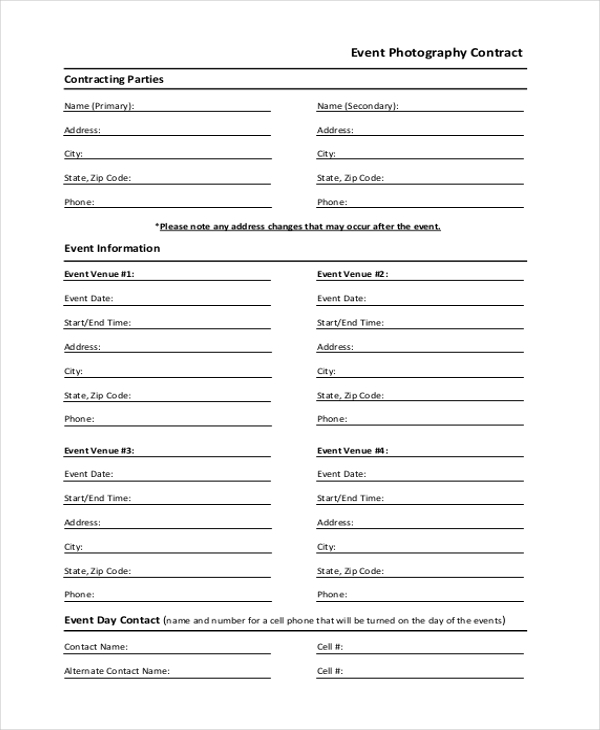 Just look for event contract forms online. These are readily available and finding the perfect one for your requirement would be quite easy. You can make changes to these forms to personalize them.